The deal with this award is that not only is the recipient to accept it, but more importantly, pay it forward to bloggers recently discovered who serve as inspiration. For me, there are so many who have gotten me started papercrafting and blogging about it -- and trust me, I cherish each of you "old timers," the ones with more followers than I can ever possibly dream of having. But the ones who really thrill me and inspire me are the "newbies" whose blogs are fresh, a pleasure to read, whose cards or papercrafts are those I'd like to receive (and truthfully, copy! ); who blog for the pleasure of reaching out to teach and grow. So it's going to take time for me to reveal my discoveries. And since there is no time limit imposed on these selections, I'm going to do it my way -- one by one. Today, allow me to announce my first pick. Congratulations to Donna at www.comopark1886.blogspot.com. Donna, here is your award. Your blog is refreshing and charming, highly readable and enjoyable. I love your fresh card designs and ladies, please, do yourself a favor and check out Donna's heavenly Scrap Room, pictured on her blog. You'll be envious from the get-go! In accepting this award, Donna, please post on your blog 8 things about yourself that we don't know about you. Post back a link to the blogsite that gave you the award, and then, pay it forward by selecting up to 8 bloggers whose work inspires you. Awwww....that is so nice. Congratulations on your award ...again and again...LOL. Oh my goodness, thank you Ellen! 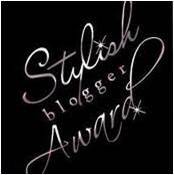 I can't believe this is the third Stylish Blogger Award in 10 days! I am honored that you even looked at my blog! And so many compliments in your message. I am blushing.